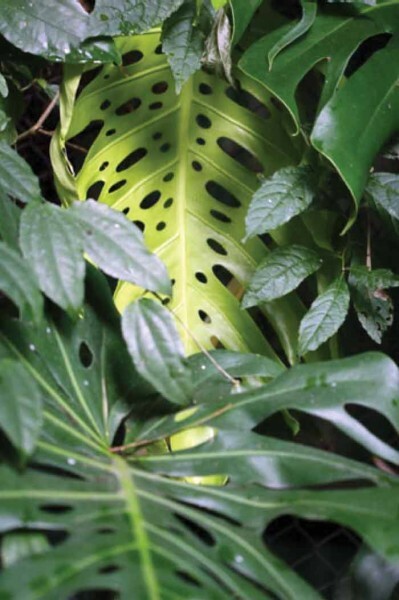 Monstera deliciosa is a common houseplant and a common gar-den plant throughout Guatemala. 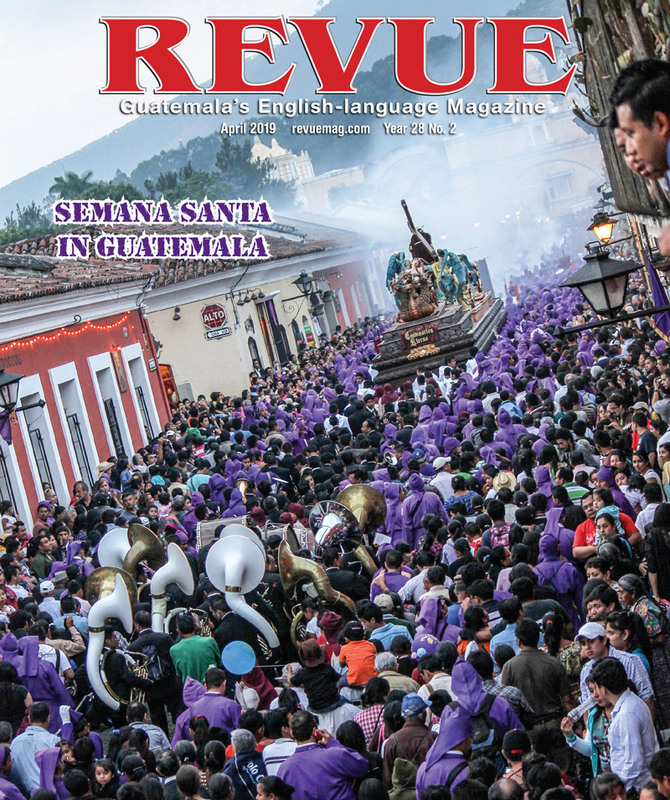 Most of my articles in the REVUE magazine have been about sacred plants and flowers that appear in Mayan myths and in ancient art of Guatemala. But this month I am writing about a plant that is not pictured in murals or in hieroglyphic inscriptions. I selected the split-leaf philodendron plant, which you see in pictures because it is so photogenic, and only this year did I learn that one part of the plant was edible. Split-leaf philodendron is one informal name for Monstera deliciosa. I myself have never heard the name ceriman, which is evidently the name favored by Julia Morton, since that is the source of the web pages of the Purdue University horticultural web site. The biology student who works with FLAAR in Guatemala, Daniela de Costa, indicated she knows this plant by the name mano de león. You can eat a philodendron? 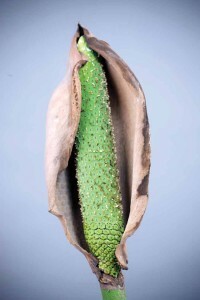 The erect spike is what you can eventually eat, after it has ripened. Since the spike has unpleasant chemicals in it when unripe, and since the plant in my own garden has never bloomed (even in four years), I have never tasted this plant. 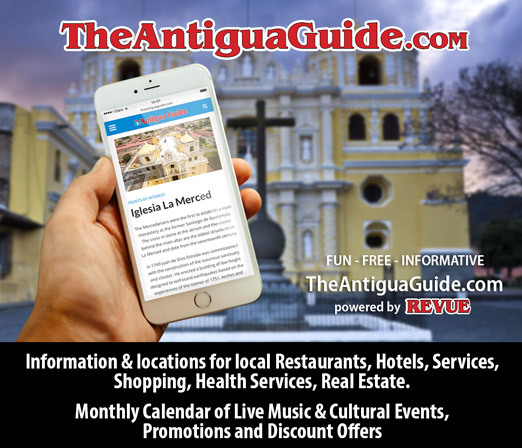 The photographs were taken at a hotel in Coban. It has been vigorously blooming all June, July and in August. I have stayed at this hotel about once a year for five years. I have photographed this plant before but never saw the flowers blooming as they were this year in the first week of June. In the botanical garden, CECON, in Guatemala City, the same species was blooming in late July. Many of the vines which grow on trees have roots that can be used for rope or other common uses. You generally peel off the bark and make your cordage from a single piece. Monstera deliciosa is one of many vines you can utilize to make rope-like material. If you wish to see Mayan basket making (using many different plant parts), we recommend visiting Chilascó, in Baja Verapaz. My split-leaf philodendron has never bloomed and grows slowly (but surely). Nonetheless this is one of my favorite plants. My plant is in the soil; not in a pot. I am at 1,500 meters elevation and my Monstera deliciosa is very healthy and happy. Unfortunately, it’s deep in the shade and has not bloomed during the four years that it has been growing. So to get the photographs that we include here, I had to go to Coban, Alta Verapaz. However, this plant is so common in all altitudes of Guatemala it is just a matter of happenstance whether you can find someone who has the same species out in the sun.